Google+ Plus, the social networking website from Google is making all the positive buzz. The user-interface and features are appealing to many users. They are even importing Facebook friends to Google+ Plus for interaction with familiar people on Google+ Plus platform. 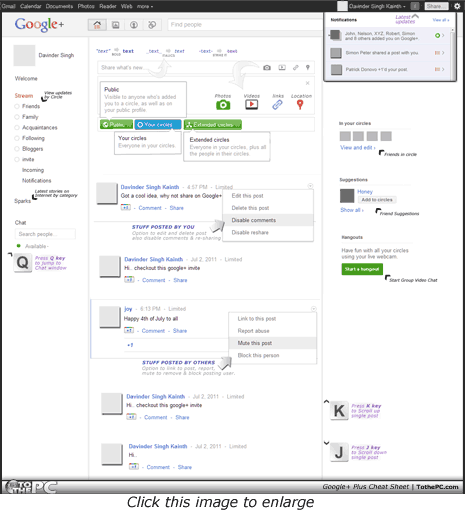 If you are over-whemled by Google+ user interface, then checkout Google+ Plus Cheat Sheet. It is a visual cheat-sheet highlighting important aspects of Google+ along with basic keyboard shortcuts for quicker navigation. 1. It highlights procedure to format and style text while posting updates. For example: ‘text’ makes text bold, _text_ makes text italics and -text- make text with strike through line. 2. It points to basic icons for type of stuff you can post including photos, videos, weblinks and even post about your current location. 3. Basic meaning of pre-defined type of circles like Public include every friend in all your circles while extended circles mean everyone in your circles and also people in their circles. 4. Option to disable commenting and re-sharing on posts published by you. Also option to edit or delete posts shared by you Google+. 5. Options on posts published by other users like link to the post, mute post, report or block other posting users. 6. Keyboard shortcuts to move single post up (use K), move single post down (use J) or quick jump to the chat window (use Q) on Google+. 7. Cheat Sheet also highlight basic elements like notifications, friends, suggestions, hangout for video chat, sparks to explore latest web content and your friend circles. 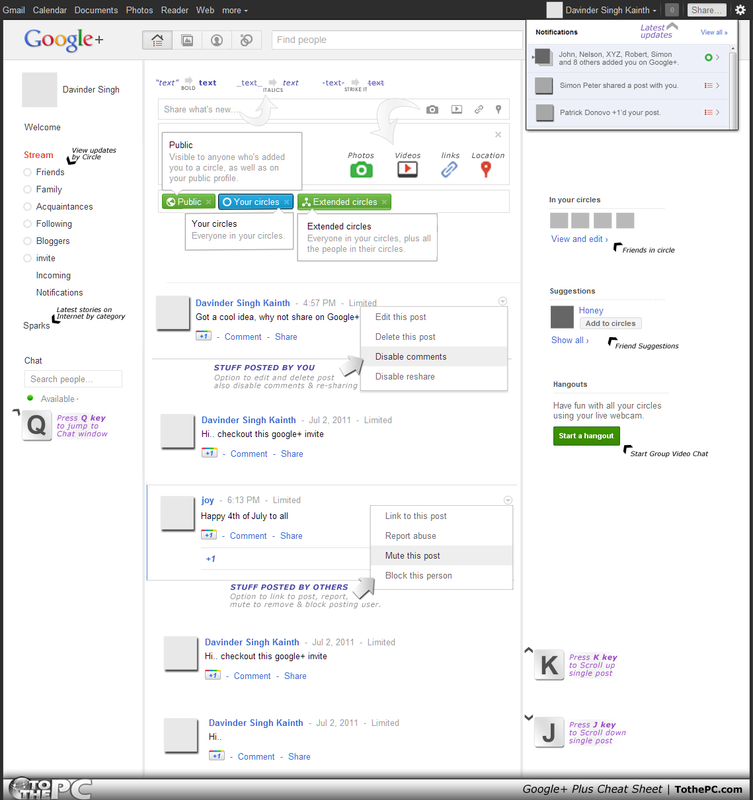 Download Google+ CheatSheet for quicker understanding of Google+ interface. This for sure will help you use Google+ in a better way.